Last week I talked a little about the Kickstarter video I was working on. I mentioned I wanted to give you a sneak peak, but couldn’t because of editing problems. Turns out editing is pretty tough! It’s fun, but definitely a big challenge. Well, today I managed to get something together for you! 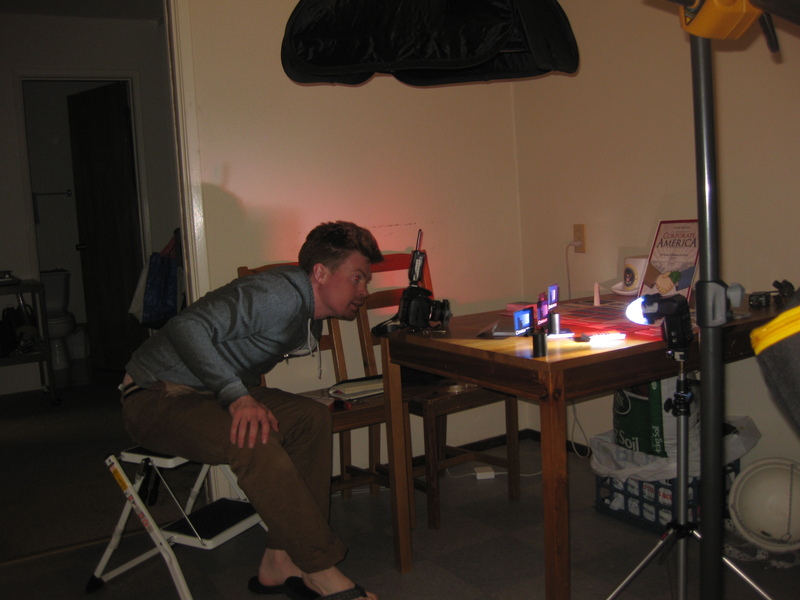 But before I get to that, I wanted to thank my friend Jonathan Potter for helping me out with some photography. 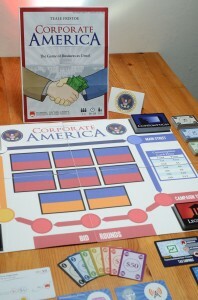 He did a great job capturing the Corporate America prototype in a dynamic, interesting way–quite a feat, given that the game is pretty much a bunch of cards! One of Jonathan’s many awesome shots. You can see a bunch of his great shots of Corporate America on his flickr page. Alright, this is actually just a preview of the main event, but it should still be entertaining (I hope). 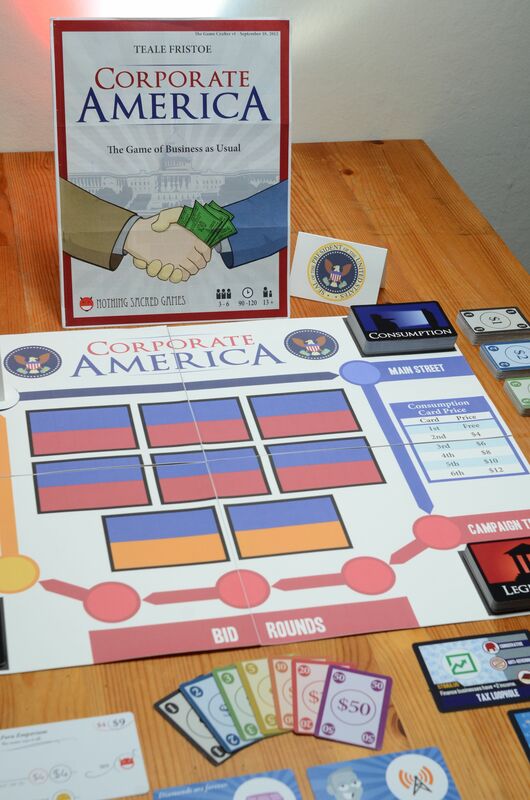 Without further rambling, I bring you… one of TWO montages from the Corporate America Kickstarter video! The video will be about 5 minutes, so getting two montages in there wasn’t easy. I loved the montage, too! I tried listening for that slip-up, Sparky, but my uncouth ears weren’t discerning enough to be able to pick it up — it sounded good to me! I guess there was a moment where I heard you take a breath, though? Right before ‘high stakes bidding wars break out all the time.’ I don’t think it is too terribly distracting or worth re-doing if it would be difficult (and based on your previous blog post, it sounds like it might be! ), BUT, if it *happens* to be easy, you might want to consider re-recording that line without taking a breath at the beginning. I’m glad you like the montage! They were definitely the most fun to film and edit. Yeah, I’m definitely not the greatest speaker, so there are a number of slip ups and plenty of hesitation throughout the video. I’m hoping it will make me seem more human 😉 The breathing thing Ben pointed out is also a common problem, so I’m going to have to learn how to edit that out, and fast. Who knew that breathing was a problem when it comes to film making? Sparky – The video will be a short example game (which this montage is a part of) sandwiched between clips of me talking directly to the camera. The whole thing is a little experimental, so we’ll see how it goes. Perhaps it’s important to communicate the gameplay mechanics too, but the montages could really sell the experience of what it’s like to be involved in the game. Do you have audio from the game too? Most of the gameplay section of the video has audio of the characters playing, which works relatively well. I never successfully got video of people actually playing the game, which is kind of too bad… capturing the results of an exciting election, a powerful and surprising Executive Privilege card being played, or even terms like “flip flopper” popping up would have been great selling points.